Mushroom Wisdom is one of my favorite companies because they have no fillers, binders, artificial colors, flavors or preservatives. This is a high-quality product which is one of the many reasons thousands of patients have found significant relief for so many ailments. I use this for memory issues and it works so well! My mom who has early signs of dementia takes it now too and I’m so thankful and happy to say it has stopped her progression. It’s such a relief to know there is something that is safe and effective! Great for me, I have moderate Lupus ( no organ involvement) and it seems to help balance my immune system, I don’t get as sick as I used too. Plus, this company is the only reliable one for mushrooms, they don’t have chemicals or additives and they have FDA approval for a few things including research on using this for treatments. 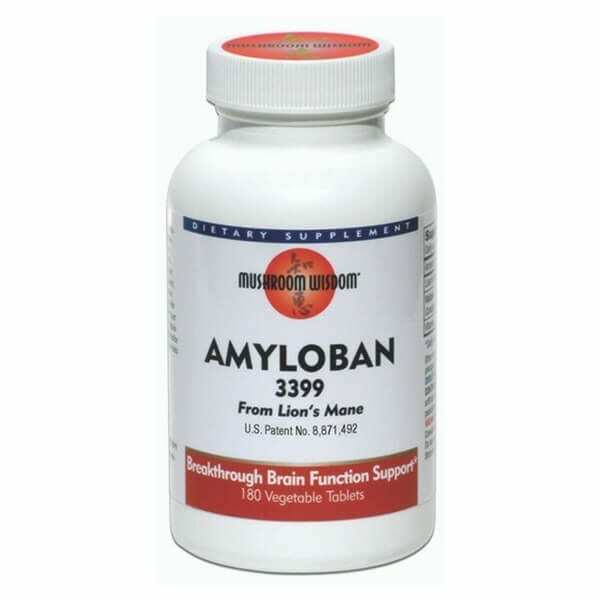 Amyloban 3399 is a mushroom (tasteless and stinky free) that supports the nerves in your brain, promoting better memory recall. Commonly known to aid with increased mental clarity, memory, and ability to think faster. CAN HELP DECREASE nerve pain from Fibromyalgia and other chronic nerve pain conditions. PROVEN METHOD through various studies showing it supports healthy nerves and brain – Japanese patent 394,3399. Various studies support healthy nerves and brain function (Japanese patent 394,3399) and many have seen such a huge improvement with their brain fog, memory loss, and chronic fatigue syndrome. COMPOUNDS from this mushroom and may stimulate the production of Nerve Growth Factor (NGF) in the brain. The nerve growth factor is a protein that is important for growth, maintenance, and survival of certain target neurons (nerve cells). It also functions as a signaling molecule too. 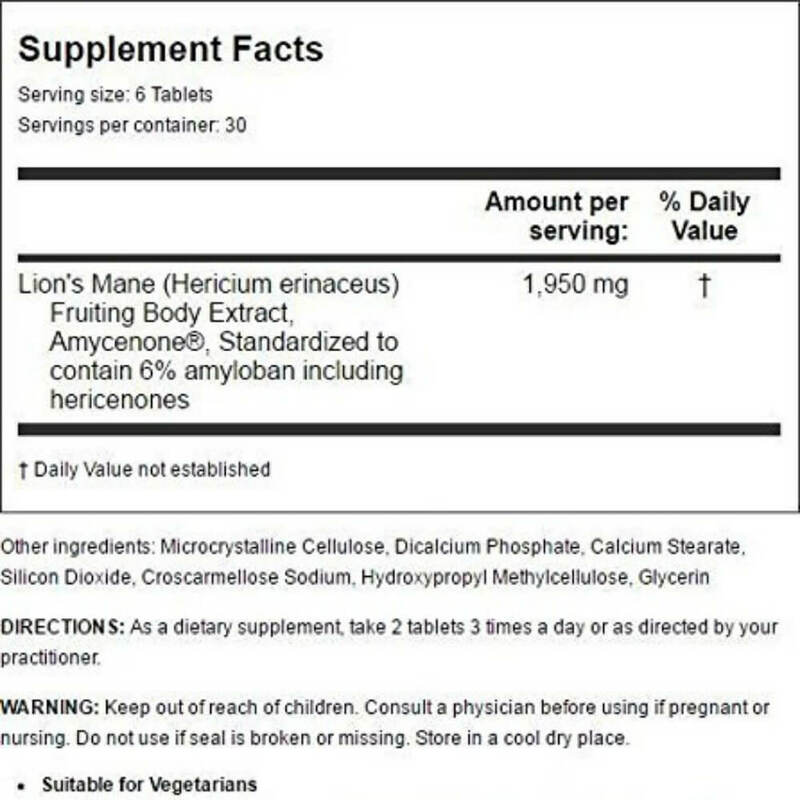 Amyloban 3399 contains Hericenones, what is it? Hericenones is a cytotoxic phenol.. what?! Cytotoxic means toxic to cells or cell killers (harsh, I know). Phenol is a chemical compound – OH. Many hericenones were isolated from the fruit body of the mushroom, Lions Main. These compounds were found to show very important neurological activities like inducing the production of nerve growth factor (NGF), diminished cytotoxicity of b-amyloid peptides, and protect neuronal cell death (apoptosis) against oxidative or endoplasmic reticulum stress (ER stress). Oxidative stress is when there is an imbalance between the body’s system to detoxify or repair against reactive oxygen species. It can break cells DNA (very bad). This is where it’s thought to be involved with cancer, ADHD, Parkinson’s, Depression, Chronic Fatigue Syndrome, Autism, Alzheimer’s, Sickle Cell Disease and more. Hericenones ability to promote NGF production was found to be comparable to epinephrine, which can stimulate NGF too. Great question. They are apart of the neurotrophins family, called neurotrophic factors (NTFs). NTFs play a key role in regulating neuron cell death during the proliferation (increase in the number of cells) process and help recover damaged neurons. Therefore, brain injuries and memory problems associated with aging can be effectively treated for the core problem, not just slow down symptoms. Since NTFs don’t cross the blood-brain barrier, it’s important to induce NGF synthesis in the brain by certain compounds. Hericenones can possibly do this, as shown in vitro studies with rodent astrocytes. A fat-soluble nootropic product(cognitive enhancer). It contains dilinoleoyl-phosphatidylethanolamine (DLPE) which is a phospholipid that has shown to be crucially protective against cell death when endoplasmic reticulum stress is the cause. This is how many brain diseases start. DLPE is capable of suppressing ER stress. Therefore, it can prevent disease and promoting some reverse of damage. They have IND (Investigational New Drug) approval from the FDA for its Pro Maitake D-Fraction (Tincture) for Phase II clinical studies on advanced breast and prostate cancer patients. It is rewarding and promising to see a supplement company have such success in obtaining IND approval for a dietary supplement product since this has traditionally been regarded as a process by which only giant pharmaceutical companies develop new drugs and make a business out of it, rather than helping people heal from the cause of disease. Write in a journal every day how you feel before you start taking it and every day for a month to see progress. Sick of brain fog and nerve pain? Order today!